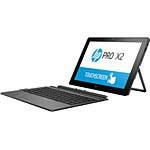 Enjoy the sleek design of the 2-in-1 HP Pro x2 612 that converts to a tablet for full speed on the go. The tablet features a large 12" touchscreen and a keyboard dock for a traditional notebook experience. 8GB 1866MHz DDR3L SDRAM, maximum. Video memory: Shared system memory with Intel HD Graphics 615. Windows 10 Pro 64-bit Edition is pre-installed. 4-cell Li-Ion polymer battery pack with 42WHr capacity.